Building Strength, Coordination, and Confidence Through a Variety of Professionally Instructed Classes! is focused on building strength through a variety of movements, with a multitude of classes including American Ninja Warrior obstacle training, Parkour, Tricking, Flipping, and Freerunning. All of our age appropriate classes are designed to meet our student’s skill levels with limited class sizes taught by passionate and experienced coaches. In addition to our classes we also offer frequent Open Gyms! from other ninja and gymnastics gyms is our passion for holistic movement, fun engagement, and highly talented and passionate coaches. Our classes and disciplines will challenge our students core strength, upper bodies, agility, and leg strength. We teach our student discipline, self respect, and respect for others. We give back to our communities through fundraisers, charitable donations, and charity support. If you’re new to Ninja obstacle training or Parkour we offer FREE 30 minute intro classes in all locations to make sure we’re the right class for you! 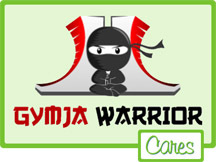 Click for Gymja Warrior April Vacation or Summer Camp Registration! Join or support our American Heart Association walking team! Our MISSION is to develop today’s youth into tomorrow’s leaders by fun and challenging exercise, problem solving, and personal goal setting. Our GOAL is to build our student’s coordination, balance, and upper/lower body strength to make them great athletes in any sport. Through play and constant challenge we are making it as fun as possible so our athletes won’t realize they are working out. to see our current class schedule and sign up!